I was very lucky to receive a copy (as well as ones to give away myself)! I found the book’s information to be very useful overall, especially for an amatuer seamstress. The first book is an equally great text for those learning to sew. I have always been terrified of sewing on knits, but recently I purchased a tee that was just way too long. I ended up shortening it myself, using my oooold Singer. It worked out perfectly, and now I’m not scared of stretchy fabric! Aw come on Erin. I bet you could make a killer roller skating outfit out of knit fabric. There are some really killer knits out there (not your grandma’s double knit fabric!). I don’t know about making your own T-shirts – it’s difficult to find nice 100% cotton jersey. It’s one of those items that is almost always cheaper to buy than to make (even if you’re staying away from China-made products). That said, I love making little knit dresses for my nieces. Working with knit isn’t nearly as hard as tissue lame or silky poly. This will be good because my neice likes t-shirt fabric (cotton jersey, I guess Channel would call it). PS: at the vintage pattern wiki, how do you embed the pattern image in the new page you’ve created? I uploaded image, but now I think it’s just floating around in there on its own! no worries on 7811, I fixed. You don’t need to put the whole URL in, just the image filename. I love wearing knits, but I haven’t got the knack of sewing them yet.I am saving up for a serger and then I will try again. WAAAAAAAA! Are you two talking about the wiki uploading?? I still can’t DO it! I figured it out…you use the icon button on the toolbar when creating or editing the new page. Yay – I’ve been meaning to get my patterns uploaded; a chance to win something is a good motivator! I bought this book and I have to say I am disappointed. After I made my first t-shirt, I realized that my questions would not be answered in the book. What is it about all these new “hip” sewing books that eschew details? Not to mention the inane writing. Bring back the content! But anyhoo, without a coverstitch machine, hemming knit fabric is hard to do–it makes a kind of “wavy lettuce edge” as it inevitably stretches while you zigzag it on your sewing machine (my serger was doing this too, until I adjusted the presser foot pressure).She barely addresses this issue and doesn’t offer many , if any, solutions. One thing you can do is ease up the pressure on your presser foot, if it’s adjustable, or press down on the fabric right behind the presser foot while you sew for two to three inches at a time, essentially in an attempt to create your own differential feed. Ironing can also help “unstretch” the fabric. First off, Erin, I love your blog. It has inspired me to a) start sewing again, and b) wear more skirts and dresses! I’ve spent much of today perusing the archives, and I noticed the name of one book about altering patterns come up a couple times, and to my dismay I cannot remember the title. I believe it was three words, either “Fit to ___” or “___ to Fit”, but I’m not positive. It wasn’t the Palmer book (“Fit for Real People”). Any help regarding the title would be greatly appreciated! loving your blog! wanna trade links? 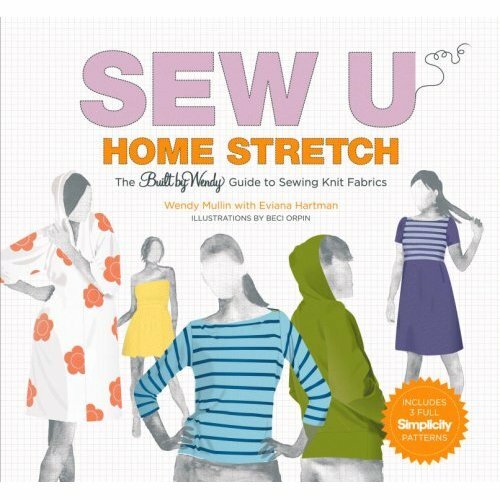 I bought the first Sew U book, and while I did find it easy to read & understand, I was PISSED that the patterns included were in small sizes only, a fact not mentioned anywhere on or in the book. I am a glamazonian 5’10”, and the idea of me fitting into these tiny patterns is laughable. I e-mailed the author months ago about this & never heard back.I will go back to it eventually, but since my whole goal in re-learning to sew was to to avoid this sort of angst, my snit is currently still in fairly full flame. quitelight needs to come take a look at my pattern store, Born Too Late Vintage Patterns, which caters to women who are glamazons.